"Take one of these home to your sister, George!" We are Red and Denton. Hi. Hello. Nice to meet you. There are some things you may wish to know about us. If you are the inqusitive sort, please continue reading. First things first: We hate the Yankees. Hate them with a passion. A deep-seated passion instilled in us by our predecessors. They are the fly in our oatmeal, the Joker to our Batman, the pain in our collective arse. They are, as Larry Lucchino so eloquently phrased it, the Evil Empire. And we were this! close! to beating them. There are some people who say that it wouldn’t have mattered to them if the Sox lost the 2003 World Series to the Marlins, just as long as they beat the Yankees for the AL Championship. While we are hesitant to say a Series victory isn’t the ultimate goal, beating the Yankees would have been a tremendous event, lifting generations of monkeys off our backs and smashing all this Curse nonsense to tiny pieces. It would have been a majestic good time, giving Red Sox fans everywhere the chance to know what it feels like to watch our heroes douse each other with champagne while George Steinbrenner looks on in amazement and disgust. It would have felt so friggin’ nice.But it was not to be. You can ask Grady Little about that. Like most Red Sox fans, we were sick after Game 7 of the 2003 ALCS. Couldn’t sleep. Didn’t want to eat. Listened for hour after hour as fans lambasted Grady and dissected the game on sports radio. Watched with some sense of satisfaction as the Marlins celebrated on the Yankees’ turf. But it couldn’t keep us from thinking that it should have been us. Spiraling, we caught our breath and decided to channel our energies into something positive. No more punching walls, throwing beer cans or threatening the kids when the Sox dropped a game. No, we’d start a weblog! 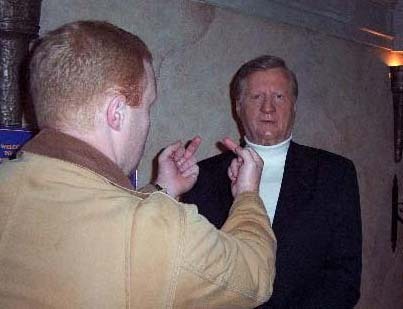 A place to vent our frustrations and slather our joys as the Sox, restocked and reloaded, make their way through the 2004 schedule in a bold attempt to right the wrongs of last season, set the universe back on its proper axis, and stuff a bat up Steinbrenner’s south 40. If you’re looking for anything philosophical or insightful, or an exacting analysis of Mark Bellhorn’s OBP with two outs and a left-handed hotdog vendor in the stands, you’re gonna be disappointed. This is just two guys bitching and moaning, praising and obsessing. 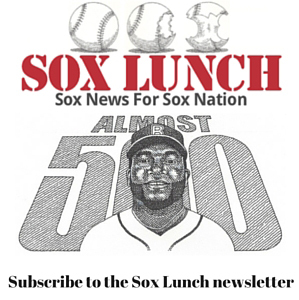 It’s the life of a Sox fan, in convenient electronic format. Denton (center) accepts Surviving Grady's award for Best New England Sports Blog from TruFan president Rafe Anderson (right) and WEEI's Mikey Adams (left). — Stewart O’Nan, co-author (with Stephen King) of Faithful. Since this blog began in 2004, we’ve been fortunate to have a number of nice things said about us by a number of high-profile media establishments. Surviving Grady was named Best Overall New England Sports Blogat the 2009 TruFan New England Blog Awards. Votes were submitted by fans, which is cool. Deadspin named SurvivingGrady.com among the top three Red Sox blogs. The Boston Globe featured an article about us and the blog back in 2007. You can access a PDF of the story here. The Boston Phoenix also interviewed us about our book. You can read that interview here. The great Amalie Benjamin, Red Sox beat writer for the Boston Globe, was kind enough to give SG a shout out in one of her Amalie’s Mailbag columns. You can check a PDF of that here (scroll to the last question).